[Based on a BBC news item released yesterday:] Researchers have identified what they say are the oldest-known musical instruments in the world. The flutes, made from bird bone and mammoth ivory, come from a cave in southern Germany which contains early evidence for the occupation of Europe by modern humans - Homo sapiens. Scientists used carbon dating to show that the flutes were between 42,000 and 43,000 years old. A team led by Tom Higham at Oxford University dated animal bones in the same ground layers as the flutes at Geissenkloesterle Cave in Germany's Swabian Jura. Nick Conard, the Tuebingen University researcher, who published in 2009 about the then earliest flute, was excavator at the site. What is the role of core knowledge in music and language? From 29 May 2012 through 1 Jun 2012 at The Lorentz Center in Leiden the workshop Core Knowledge, Language and Culture will be held. This workshop will address the relation between core knowledge, language, music, and culture, with a view to assessing the current understanding of these questions for a theory of the mind/brain. We hope that the participants – scholars from fields as diverse as psychology, linguistics, neurobiology, neurolinguistics, music cognition, and cognitive anthropology – will contribute to defining a research program that may address both new and as yet unresolved research questions in this area. To give one example, it is puzzling that a notion such as recursion (and the cognate notions of Merge or successor function) seems to play a role in apparently unrelated domains such as number/arithmetics, language, and music. Both linguistic and nonlinguistic quantification seem to be built on shared primitives. Such issues are often related to the (dis)similarity or (dis)continuity between the animal and the human domain. The question arises whether core knowledge of number constitutes an intriguing exception to the discontinuity thesis, with potential ramifications for the representation of time and space in the spirit of Kant. The organizers of the workshop will be pleased to facilitate an open and fruitful debate on these topics. See for more information the Lorentz Center website. Is the ability to distinguish 'speech sound contrasts' strictly human or also present in birds? 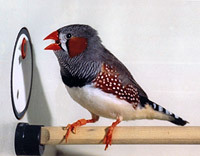 For various reasons the song of songbirds are currently considered to be the closest animal analogue to language. This raises questions about to what extent particular perceptual and cognitive abilities that are considered to be closely linked to the production, perception and learning of language are present in songbirds. In an upcoming SMART-Talk at the University of Amsterdam on Friday 25 May 2012, Prof. dr Carel ten Cate (Leiden University) will address two of such abilities. One concerns speech perception: is the ability to distinguish specific speech sound contrasts strictly human or also present in birds? The other one concerns the ability for detecting and learning particular grammar rules, using the paradigm of artificial grammars: what is the level of complexity that birds can cope with? These findings in birds will be related to those obtained in other animal species. What's new and happening in music cognition? 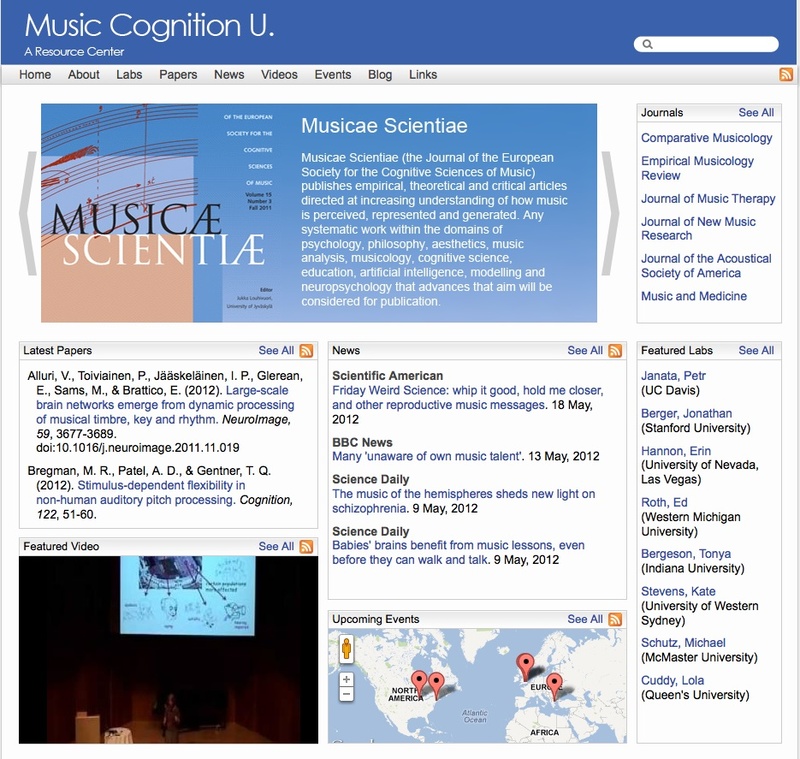 Dan Levitin (McGill University) recently started a new website Music Cognition U., a Resource Center that is supported through a grant from The Social Sciences and Humanities Research Council of Canada. 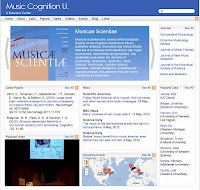 The website is designed and maintained by a group of music cognition research scientists to communicate the latest findings to the public, to students, public policy makers, and other researchers. It is also a place for people to communicate, comment, and share their experiences and thoughts about music with one another and the research community. What is the relation between core knowledge systems, music, and language? 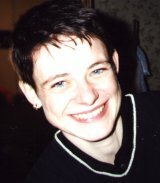 On Thursday 24 May 2012, 11.00 – 12.30 there wil be a seminar at NIAS Campus on the Horizon research project Knowledge and Culture that was recently submitted to NWO for funding. In this project, we intend to study the relationship between innate cognitive capacities that are not specific for humans, so-called core knowledge systems, and innate cognitive capacities that are uniquely human, such as language and music. The core knowledge system for number, for instance, has been argued to contain two nonverbal subsystems that are present in both newborn infants and animals. The Approximate Number System (ANS) compares the numerosities of distinct sets without individuating their members. The Object Tracking System (OTS) yields representations of small numbers of objects, i.e. 1 to 3 (perhaps 4), and does not work on sets larger than 4. Linguistic evidence suggests that the split between OTS and ANS is reflected in the language system, and that children acquire numbers in a sequence. We have known for some time that babies possess a keen perceptual sensitivity for the melodic, rhythmic and dynamic aspects of speech and music: aspects that linguists are inclined to categorize under the term ‘prosody’, but which are in fact the building blocks of music. Only much later in a child’s development does he make use of this ‘musical prosody’, for instance in delineating and subsequently recognizing word boundaries. Henkjan Honing will make a case for ‘illiterate listening’, the human ability to discern, interpret and appreciate musical nuances already from day one, long before a single word has been uttered, let alone conceived. It is the preverbal and preliterate stage that is dominated by musical listening. Johan Rooryck is the Distinguished Lorentz Fellow 2011/12, and Henkjan Honing holds a KNAW-Hendrik Muller Chair in Music Cognition and is Professor of Cognitive and Computational Musicology at the University of Amsterdam. Interested in a postdoc position in music cognition? The Lyon Neuroscience Research Center is seeking applicants for a 2-year post-doctoral position that integrates into our research project on congenital amusia funded by the French National Agency of Research. 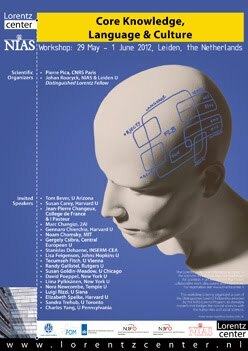 The post-doctoral researcher will work with Barbara Tillmann (Auditory Cognition and Psychoacoustics team) and Anne Caclin (Brain Dynamics and Cognition team) at the Lyon Neuroscience Research Center, and will conduct behavioral and EEG/MEG experiments investigating the cognitive and neural correlates of this musical deficit. For information on how to apply, see the website of the Lyon Neuroscience Research Center.